Walking is a great form of physical exercise for both you and your dog. Not only does it effectively strengthen muscles with less strain, but it also helps with balance and coordination, as well as reducing the risk of various diseases. But, this fact is not only true for humans. It also applies to man’s best friend which means it should be an important part of any dog owners day. The Cleaner Paws Choice: RUFFWEAR All-Day Adventure Harness – This is by far the best no pull dog harness they we trialed at it’s price point. Excellent value for almost any pet owner, we highly recommend! 2 Hounds Design No-Pull Dog Harness – The professional’s choice, this harness is perfect for controlling dogs of almost any size. Slightly more expensive than the PetSafe Easy Walk, however the extra dollar spent could save you a whole lot of hassle. Kurgo Tru-Fit No Pull Dog Harness – Available in a number of sizes, we actually discovered this harness to be the best choice for larger pets. The front harness really does give you a level of control that is hard to find elsewhere. Just a head’s up that Kurgo are running an offer on this harness until Saturday, February 23rd 2019. Like us, dogs need to go on regular walks to stay physically and mentally fit. To make sure dogs stay close to their owners at all times during these walks, they are encouraged to be leashed. However, this is not always an easy task, especially for new owners with very energetic dogs or owners of large breeds that at times can be difficult to control. This guide has been designed for dog owners that want to enjoy walking their dog without having to worry about their pet misbehaving or pulling too hard. If this is the case for you than a no pull dog harness is a brilliant alternative to traditional types of dog leads and we hope to better inform you why exactly that is. So, Why do Dogs Pull in the First Place? There is a common misconception that dogs pull on their leash because of the natural dominant trait hard coded in their DNA. This is not the case. There are several reasons why a dog pulls on their leash. The first is being untrained, as like tricks, comfortably walking on a loose leash is a learned behavior. If a dog is not corrected about this pulling at an early stage, they will grow to think that there’s no problem with it and will keep on doing it. Fact is, the longer the dog keeps on behaving this way, the harder it will be to train them to stop. Your dog may begin to think that this is how you want them to be walked and they know that if their owner is happy, they will be rewarded. But among these reasons, the most probable cause for this particular type of behavior may be attributed to the equipment used. Oftentimes, when a dog is not comfortable with their collar or harness, the tendency is to try to remove it – thus, the pulling. Luckily, there are specially-designed harnesses which primarily aims to prevent this negative behavior and as you already here we hope you’re looking forward to learning more about the best no pull dog harnesses for your pet. Due to the nature of training your dog to walk properly it is recommended that you invest in a no pull dog harness as a puppy. Although this may not sound necessary as some puppies are still not strong enough to pull their owner, by teaching them effectively from an early age you will stop any bad habits immediately in their tracks. What Exactly is a No Pull Dog Harness? A harness is an effective tool used by owners to train their dogs to walk obediently on a loose leash. Compared to the traditional collar, it is designed to avoid exerting too much pressure on the dog’s neck while walking. This feature not only makes it more comfortable, but it also avoids choking and other uncomfortable issues for you pet. 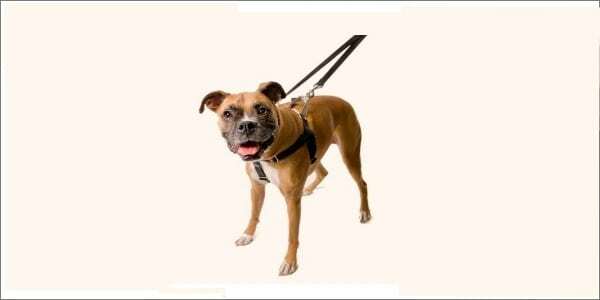 As TheDogClinic.com mentions, this is one of the benefits of a head halter style dog harness which can be used until your pet is trained to walk without pulling. Due to the comfort that harnesses provide, some of these were specially created with the primary goal of discouraging pulling. The no-pull dog harness comes in various designs, but a common feature includes a front clip where the leash is attached. Through this, dogs are often tilted and led back towards their owner whenever they start pulling. And when this happens, the owner can gently discourage such behavior. Dog harnesses are generally of three types; the back attachment harness, the front attachment harness, and head collars. Each of these types of dog harness fit a specific purpose, and has their own advantages and disadvantages. The back attachment harness is probably the most common type of harness in the market. This type allows the leash to be attached at the back of the dog. This is attachment ring is often located behind the dog’s shoulder blades. Experts suggest that the back attachment harness effectively takes pressure away from the dog’s neck, making it the best alternative for a collar. This is recommended for dogs who are recovering from a traumatic choking experience, or an operation in the neck area. It is also a comfortable walking companion for trained dogs. Unfortunately, the back attachment harness is not recommended for dogs who pull since it actually encourages the pulling. This type of harness offers the owner a limited amount of control. On the other hand, the front attachment harness has the leash attachment ring situated on the chest area. This is the best harness for discouraging dogs to pull. It works by turning the dog back to its owner whenever they attempt to pull away. And once the dog realizes that they can only go forward, they will soon stop the pulling behavior. Unfortunately, the front attachment harness is not recommended when running or jogging with dogs as it can get tangled under the dog’s legs easily. It can also be quite uncomfortable for the dog if they’re being tugged from the chest to stop running. Instead we have put together a guide for the best dog harnesses for runners so you can find the ideal solution if you want a product that can help keep your dog fit with you. Owners must also make sure that this type of harness perfectly fits their dog. Otherwise, dogs can easily slip out of it if it’s too large, or it can cause chaffing it’s too small. The last type of harness is the head harness or head collar. Unlike the traditional collar, this item is fitted onto the dog’s head and around its nose with the leash attached under the chin. In effect, when a dog tries to pull, their head is forced to turn towards the direction of their owner and causes them to cease from both pulling and walking. This harness causes a gentle pressure to be exerted, and is highly recommended to stop aggressive dogs from pulling. However, it may take a while for dogs to get accustomed to this type of harness. It makes the dog feel like he’s being muzzled, so it can be uncomfortable at first. Experts also advise that the head harness should only be used during the training stage. Fortunately, harnesses are available in a wide range of sizes. There are several brands that offer a range of petite sizes, while there are also those who offer double XL sizes, meaning no matter what size your dog is you will find a harness to suit. There are also some harnesses which perfectly fit dogs who weigh as light as five pounds, while some harnesses have strengths going up to more than 3,000 pounds. Nonetheless, owners are always advised to thoroughly study the measuring and fitting guides to ensure the perfect fit for their beloved pet. For a general body harnesses, the dog’s girth can be measured around the widest part of their rib cage. Some harnesses require measurements around the dog’s upper and lower necks, and the length of his body. This not only ensures a perfect fit, but also makes sure that the dog’s chest is padded properly. To conclude, whether a dog comes from a small, medium, or large breed, there will always be a perfect harness to fit their size. All it needs is patience in finding the best no pull dog harness for your pet. The PetSafe Easy Walk Harness keeps dogs stress-free when taking walks. It is available in eight sizes with four adjustment points to ensure comfort and the perfect fit for different dogs. The Easy Walk Harness is specially designed so that the chest strap would rest across the breastbone to avoid gagging or choking. Users highly recommend this harness for its front clip design which efficiently keeps dogs from pulling. They also report satisfaction with its machine-washable material and durability. However, users have warned against buying the wrong size since it may cause the dog’s skin to become sore. TIP: thoroughly study the fitting guide prior to making a purchase. The HALTI Headcollar is one of the most popular non-pull harnesses in the market. It features a unique design which comfortably follows the outline of the dog’s face to keep him from pulling and avoid choking. The collar comes in six sizes, and is made of nylon webbing with leather or neoprene padding to ensure comfort. This product is especially recommended for aggressive dogs. Users praise its slip ring which gently keeps the jaws closed whenever the dog tries to attack, but allows them to bark and pant whenever relaxed. Some dog owners note that it can be a struggle to put the collar on dogs who are uncomfortable about being muzzled, but it eventually works out after the dog has relaxed. Always take the time when getting your dog adjusted it. NOTE: It is also not recommended with a leash longer than six feet. One of the most highly-rated harnesses is the Freedom No-Pull Dog Harness. The design boasts of a loop at the back which gently tightens around the chest to discourage the dog from pulling, and a ring on the front for additional control. The harness comes in fourteen colors, and has seven sizes ranging from a minimum of 14 inches to a maximum of 44 inches. The Freedom No-Pull Dog Harness is praised for the amount of control it offers to owners. Users recommend using this as an aid for training puppies and aggressive dogs. However, the front leash attachment is not recommended when running with dogs, and also for a leash which is longer than six feet. The No Choke No Pull Harness claims to be the best front-leading harness in the market. Its design helps train dogs to stop pulling, and guarantees that the owner remains in control. It is made of Polypropylene webbing, and is specially sewn to avoid sharp edges. The harness is available in eight colors and seven sizes. Users claim that the No Choke No Pull Harness by Walk Your Dog with Love is easy to put on and remove. They also applaud this product for helping them stop the pulling of aggressive dogs. However, this harness is not recommended for running with dogs. For a more stylish option, Chai’s Choice Front Range Dog Harness is the answer. The harness boasts of a scratch-resistant outer layer, a buckle capable of handling stronger dogs, and zinc-alloy rings to ensure quality and durability. It comes in five colors, and five sizes ranging from extra-small to extra-large. Satisfied customers agree that the item has premium material, and provides pets with a comfortable experience. Its reflective outer material also helps make your dog more visible if you’re walking with them at night. However, some owners of big dog breeds have experienced issues with the buckles. This is highly recommended for small to medium sized breeds with manageable aggression issues. The Kurgo Tru-Fit Dog Harness promises comfort and versatility. It features a padded chest plate, quick release buckles, and five adjustment points. The harness comes in six sizes and is capable of handling dogs weighing up to 36 kilograms. It also comes with a Krugo Lifetime Warranty in case of manufacturer defects. Dog owners especially love this harness because it is easy to put on and take off. Its design also ensures that hassle-free adjustments. Some owners share a minor issue with the chest plate, since it may not perfectly fit some smaller dog breeds. Overall, it is still one of the highly rated harnesses in the market. The EcoBark Pet Suppliers Dog Harness boasts a no-choke design and a padded vest to guarantee control and comfort. This eco-friendly harness is made up of non-toxic meshing with strappings made from recycled water bottles. 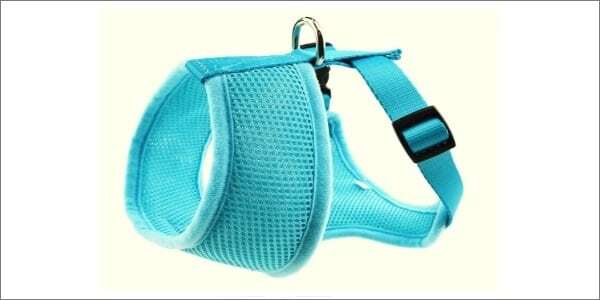 This product is available in eight stylish colors, and in five sizes which fits dogs with a chest girth of up to 29 inches. Customers are pleased with the harness due to its no-choke design. They also applaud the fact that the mesh is made of breathable material which doesn’t trap in the dog’s body heat. A minor issue is the non-adjustable neck collar, but most owners are not bothered by it. The Petsafe Gentle Headcollar features a simple yet functional design. It is made up of strong nylon which is padded with neoprene material. The harness is available in eight colors and five sizes. It can fit dogs weighing from 5 pounds up to about 130 pounds. Although it is placed onto the face and around the nose, the harness promises to be pain-free and comfortable. Satisfied customers recommend using this harness as an additional tool to training dogs. It has been effective in suppressing unwanted aggressive behavior like lunging and pulling. It is also highly lauded for delivering results almost instantly. The Harness Lead Escape Resistant is one of the best rated dog harnesses in the market. It is made of soft material to make sure that the dog’s skin will not be irritated. It also boasts a strength of up to 3,700 pounds. The harness comes in nine colors and two adjustable sizes. Happy customers love the lightweight material on the harness, making it comfortable for puppies. Although available in only two sizes, most owners have no issue with adjusting the straps to make it fit perfectly. However, some owners share that it may appear to be too bulky for smaller breeds. If you do have a dog that is particularly adept at wiggling free from a leash then it is worth checking out the best escape proof harness reviews. Another value for money harness is Ruffwear’s Front Dog Harness. This harness is designed to have padded chest and belly panels to ensure optimum comfort. It is also strategically designed to have secure attachment points for control and durability. The harness comes in ten reflective colors and five sizes. Most users recommend this harness because of its high quality material. They experienced no problems with putting it on and removing it from their dogs, and the adjustment points made it easy to fit perfectly. Despite being more expensive than competing brands, it continues to receive positive feedback from dog owners.